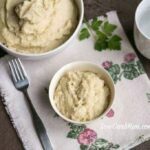 Adding mashed celery root to a basic garlic cauliflower mash provides the best texture and flavor. 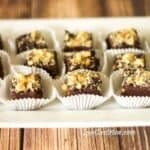 So good, others may think it’s made with potatoes! 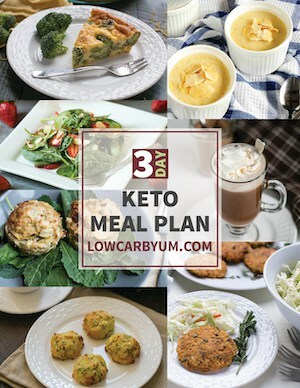 Like most low carb eaters, I seem to be obsessed with cauliflower. Lately, I just can’t seem to get enough of it. Thank goodness the shortage of this tasty vegetable has ended and it’s easy to find in the stores again. Hopefully, that will never happen again! I’ve been venturing outside the norm a little. Some folks may even think I crossed the line when I posted my cauliflower chocolate pudding last week. However, if you haven’t tried this veggie in dessert form, you really need to before judging. It tastes so much better than it sounds. I assure you! 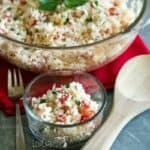 I have a few more ideas for using cauliflower in future recipes. But, let’s get back to one of it’s best uses. We all know it’s a terrific stand in for mashed potatoes. 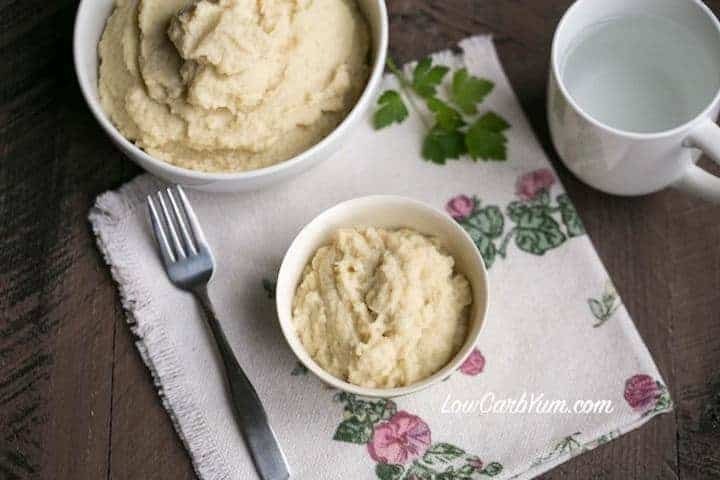 I’m a garlic lover, so I stepped up the basic recipe to make a low carb garlic cauliflower mash with mashed celery root. 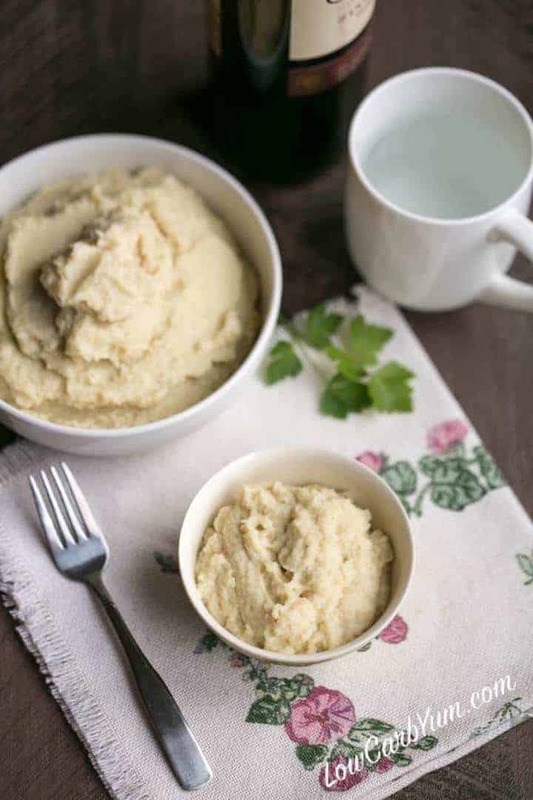 Although cauliflower makes a wonderful substitute for mashed potatoes on it’s own, adding celery root gives it a texture that’s closer to the real thing. The celery root makes it a bit thicker too. 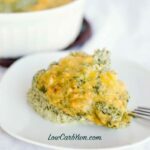 There’s a nice article on low carb faux potatoes here. To get a great garlic flavor, I roasted a few cloves of garlic in the oven. I just wrapped them in foil with olive oil and salt. Then, they were baked until they were softened. 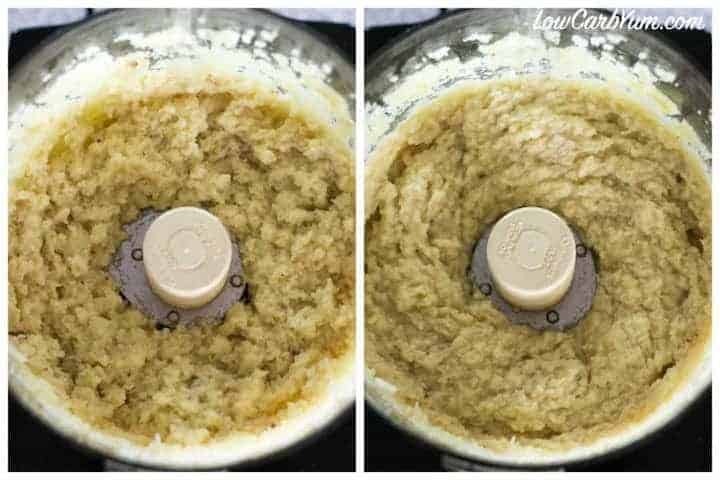 Once the vegetables were cooked, I pureed them in a food processor. Then the roasted garlic cloves, butter, and seasoning was added. Everything was then processed until smooth. If you’re following a low carb Paleo diet, the butter can easily be replaced with ghee. I always keep a jar of ghee in the kitchen. 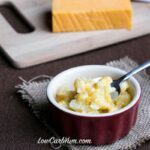 I liked this recipe using either one. 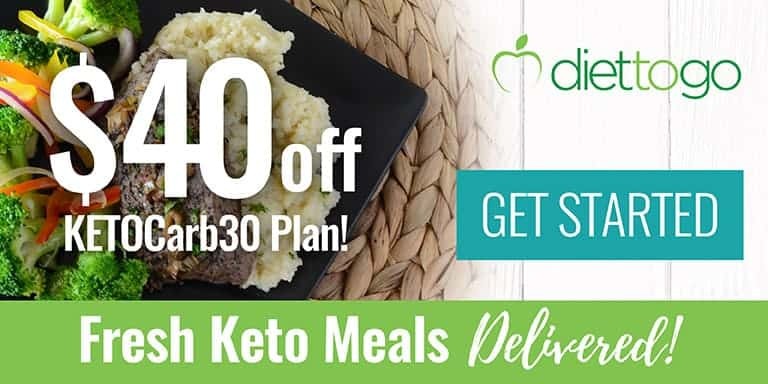 You will enjoy this yummy garlic cauliflower mash with mashed celery root as a side with a nice juicy grilled steak. 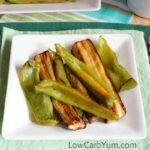 It’s also a nice side dish to serve with chicken, pork or ham. I even enjoy eating this plain as a snack. My husband doesn’t like garlic as much as I do, so I might have to reduce the garlic in the recipe if I’m going to try and pass this one off on him. He loves mashed potatoes and hates cauliflower. I may try a slightly modified mixture of both to see if he notices it’s not potatoes. 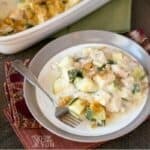 The Easter holiday is coming up so this would be a tasty side dish to serve along with a ham. I still haven’t thought about what I’m going to make for the holiday dessert. My coconut cream pie always goes over well so I could just make that one again. 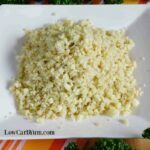 I bet this garlic cauliflower celery root mash would also freeze well. 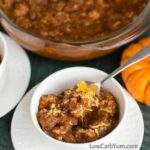 You could make up a large batch and freeze in single servings. 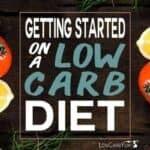 I freeze a lot because I’m the only one who eats low carb in the house. I’m still working on converting the rest of the family over. 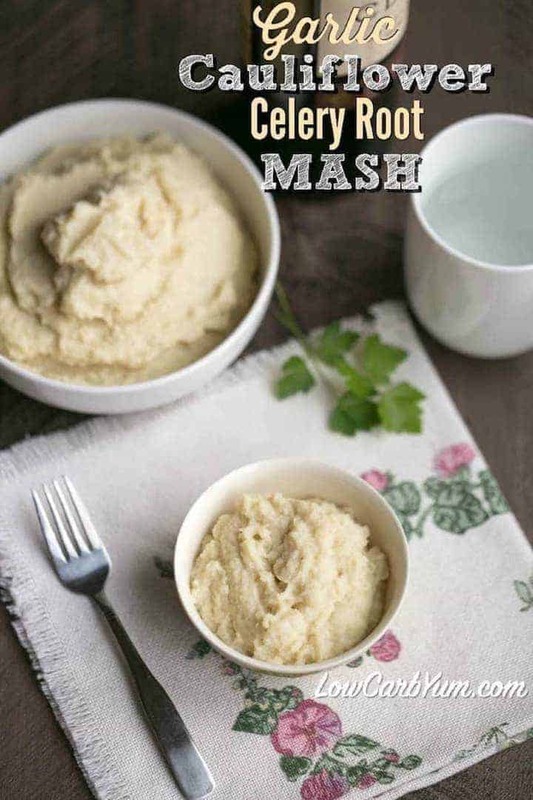 If you’d like to step up regular mashed cauliflower to the next level, try adding celery root. 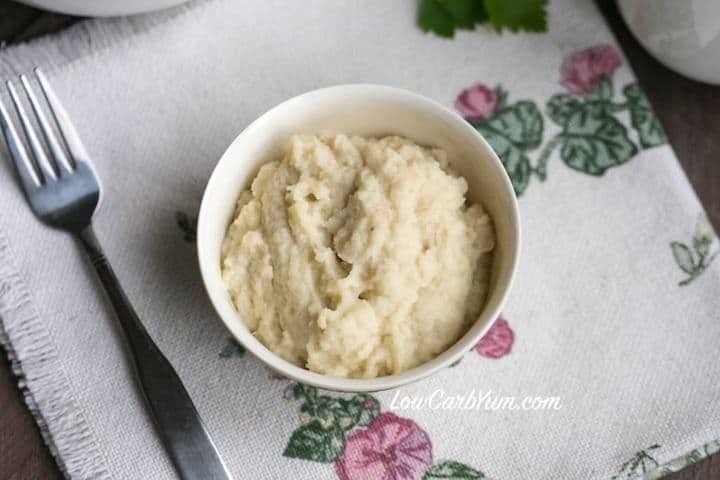 Low carb garlic cauliflower celery root mash is fantastic! 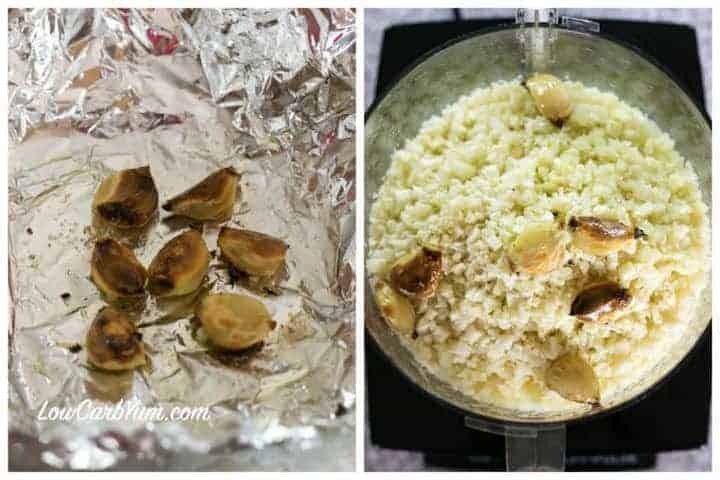 Place garlic cloves on a sheet of foil. Drizzle with oil and sprinkle with salt. Wrap the seasoned garlic cloves in the foil and bake at 400 degrees F for 20-25 minutes until soft. Boil or steam cauliflower and celery root until until softened. Drain off any liquid. 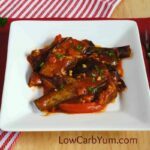 Place cooked vegetables into a food process and add baked garlic, butter, salt, and pepper. Process until smooth.